COOKIES! That’s what I think of when I think of Christmas. There are always different kinds scattered around during family get-togethers. Share YOUR favorite cookie recipe in the comments. Naomi says: Being a lover of Paula Deen, she is ALWAYS represented in my Christmas packages. I stumbled upon this recipe off of one of the sites where I always see her recipes and knew that they needed to be a part of it. After I tasted these yummy morsels, I also knew that they weren’t just for Christmas! I have to be honest. When I first saw them I must admit that I was intrigued enough that I knew I needed to t make them, but “concerned” enough that I didn’t know if they were going to get to stay on my trays. Sure enough, I found myself munching on these. I don’t know WHY I ever doubted Miss Paula! They were good not dipped, dipped and the crushed peppermint really gave them a nice twist. So, don’t think these are just for Christmas…bake away! 2) In a medium bowl, whisk together the flour, baking soda, cream of tartar, and salt. 3) Using an electric mixer, cream the butter and sugars. Scrape the sides of the mixer bowl and beat in the oil, egg, and vanilla until smooth. Beat in the flour mixture in 3 small additions, scraping the sides of the bowl after each one. Slowly beat in the rice cereal, coconut, and oats. Fold in the toffee bits and refrigerate the dough, covered, for 1 hour. 4) Drop rounded tablespoons of dough on 2 cookie sheets. Bake until the cookies are golden around the edges, 12 to 14 minutes. Transfer the cookies to wire racks to cool. 5) If desired: Using a double boiler, melt the white chocolate. 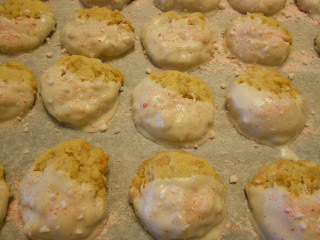 Dip the cookies into the white chocolate and sprinkle crushed peppermint to decorate. Allow to cool or serve warm.